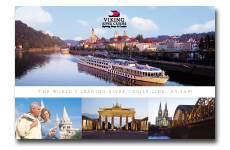 River cruising-The fastest growing segment of cruise travel. AMSTERDAM — Just how big is the boom in river cruising? So big that the head of North America’s largest river line is openly talking about having 100 ships on the world’s rivers by the end of the decade. “We shouldn’t disregard the possibility,” says Torstein Hagen, chairman of Viking River Cruises, which currently operates 35 vessels from Europe to Southeast Asia. Speaking with cruise writers this week during inaugural festivities for his line’s newest ships, Hagen said he saw no end in sight to the soaring demand for river cruises that has characterized the past decade. The number of North Americans taking a river cruise has grown at a 14% annual rate since 2001, more than twice as fast as the 6% annual growth in the number of North Americans taking ocean cruises, Hagen says. “At some stage we will have to slow down, but we really don’t see any need for a slowdown yet,” he notes. On Wednesday, Viking made cruising history with the naming of 10 new ships at once, and the company has 12 more vessels on order for 2014. Still, despite boosting capacity by 40% this year, Viking barely has any space available to sell, Hagen says. Hagen says the river cruise boom is being driven in part by the aging of the Baby Boom generation, which is beginning to retire and places a high value on traveling the world. The typical Viking customer is age 55 or older. “It’s about people who have earned some money and haven’t had time to see these things on Earth,” he says. River lines also are drawing customers away from ocean cruise lines that Hagen suggests have lost their way. Hagen ran the upmarket Royal Viking Line in the 1980s. In addition to river ships, Viking is developing ocean ships of its own that will begin debuting in 2015. The company has two vessels on order that will carry about 928 passengers a piece and could add four more ships in subsequent years, Hagen says. As with Viking’s river ships, the focus of its ocean ships will be “much more on the destinations than all of the stuff that people can buy on board … or be sold on board,” Hagen says. you are on a cruise ship. guests and crew being one of the cruise industry’s highest priorities. viral gastroenteritis, stomach flu, and/or food poisoning. and schools, in addition to cruise ships. December 2012 onboard P&O Cruises’ Oliana that was sailing in the Baltic. from vacation settings (including cruise ships). operating out of U.S. ports, down significantly from over 30 outbreaks in 2006.
norovirus by the CDC was 84. CDC’s Vessel Sanitation Program. Cruise ship medical staff or other designated personnel are required to maintain a log of cases of gastrointestinal illnesses and report those to the CDC. their hands frequently to help avoid unknowingly spreading the virus. and staff will serve them). those located at the entrances of dining areas. · Drink lots of water and get plenty of rest. Resting helps rebuild your immune system. Drinking water helps prevents dehydration. cruise to contact us to learn what their alternative cruising options may be. As an industry, the major cruise lines have been, historically, fairly unaccommodating when it comes to guests enjoying their own personal bottles of alcohol. X-ray scanners and security personnel work overtime during the initial boarding process and at ports of call to ensure that “contraband” booze doesn’t find its way into your cabin. Grey Goose is your chosen tipple? A bartender will happily pour you a shot—and charge it to your cabin. Enjoy Chimay Belgian ale at home? Buy it onboard (if you can find it). Only sodas, water and non-alcoholic beverages have tended to escape scrutiny at X-ray machines during the boarding process for most cruise lines. Industry leader Royal Caribbean International recently decanted a new policy for wine-lovers, allowing cruisers to bring up to two bottles of wine per cabin onboard at embarkation. Previously, the line had a strict “no alcohol” policy for carry-ons. Now, if you’re celebrating a special occasion while onboard a Royal Caribbean ship, there’s no reason not to dust off something special from the cellar at home. Of course, there are restrictions: Bottles must be 750ml or smaller, and if you choose to drink your wine at one of Royal Caribbean’s restaurants, bars or other common areas, be prepared to fork over a $25 corkage fee per bottle. As cruise aficionados know, Royal Caribbean isn’t exactly a trendsetter with the new rules. The line is actually catching up to most of the industry, adjusting its policy to be more in line with its major competitors. By contrast, most of the luxury cruise lines continue to have fairly liberal BYOB policies. Of course, most of them already include wines with meals in their cruise fare. But it did get us to thinking: When it comes to alcoholic beverages, how do the carry-aboard policies of the major cruise lines compare today? What you can bring onboard at embarkation: One bottle of wine per person (age 21 and up). Corkage fee: $10 in the main dining room; $14 in steakhouses. What you can’t bring onboard: Spirits, beer. What you can bring onboard at embarkation: Two bottles of wine per cabin. What you can’t bring onboard: Nothing specified. What you can bring onboard at embarkation: Alcohol is permitted but must be hand-carried in carry-on luggage. Carry-on alcohol may not be consumed in public areas but can be opened at Palo and Remy restaurants (with corkage fee). What you can bring onboard at embarkation: Wine may be brought onboard but cannot be consumed in any public venues, except for bars and restaurants (with corkage fee). What you can’t bring onboard: Spirits (no policy specified for beer). What you can bring onboard at embarkation: Wine—no limitation specified. Corkage fee: $15, regardless of whether opened by a crewmember or passenger or not at all. What you can bring onboard at embarkation: One bottle of wine per adult. Should I book now or wait, that is my question ??? What should I do ??? Disney Cruise Lines – Cheap or value, which is it?